My annual trip to the American Fisheries Society meeting took me to Little Rock Arkansas this year. Now I don't know about you, but the first thing I do when I find out I'm going on a business trip is to look and see how close my hotel is to a river or lake. When I checked this time, I was pleased to discover that my hotel was just a stone's throw away from the Arkansas River, which just had to be full of new species waiting to be caught! I'm a creature of habit, but I'd also like to think that I learn from my mistakes. At previous conferences I've wasted valuable fishing time by walking around trying to find somewhere to buy bait and licenses (see my post about Seattle WA and St. Paul MN). So in order to maximize valuable fishing time while in Little Rock, I came equipped this time with two fishing poles, an already-purchased fishing license, and even live bait! The airline people gave me quite the look when I told them there were live worms in my suitcase, but we made it! Now that I think about it, you could probably make a movie out of that - "Worms on a Plane" sounds like a promising title, or maybe "Wormnado"! ....no, you're right, that's too far. I wasn't quite sure exactly what sort of fishing to expect when I got there since I wasn't able to find any fishing reports for the Arkansas River right in downtown Little Rock. So I brought a bunch of generic baits and an assortment of hooks ranging from large to REALLY tiny. It didn't take long before the new species started coming in! Green Sunfish - Species #91. I caught another one of these that was about 9 inches long - pretty big for this species - but of course that one flopped out of my hand before I could get a picture. This massive specimen is a blacktail shiner - species #92! Also of note: I'm pretty sure this is the smallest fish I've ever caught! Sunfish are some of my favorite critters. There are quite a few species of them, though a lot of them are too small to be noticed by most anglers; I however, am not most anglers! They can be very colorful and beautiful - in their own tiny way - and I've wanted to add some new ones to my list for a while. I was pleasantly surprised that the Arkansas River is full of them! For the first two days, I stayed entertained catching gobs of tiny sunfish and enjoying their colors. This red colored one was my favorite one. I think this one's a longear too though the coloration is quite different. I know what you're thinking... this is obviously just a bluegill right? Nope. If you look at the "ear" you'll notice a tiny speck of red. So of course, this beast is called a... say it with me... redear sunfish. Creative eh? Species #95! On the last morning, I got to my spot bright and early only to realize that my worms were safe and sound inside my hotel-room fridge. I cursed and stomped for a while then weighed my options. I decided the best thing to do was to put some of my tiny fish to good use and use them for cut bait. As it turns out, I should have done this all along! I wrangled in a few tasty looking micro-fish - including a new species - and sent them out on a big circle hook under a bobber. Species #96, the blackspotted topminnow. There were lots of these little guys cruising around just under the surface of the water. Their shape reminded me of little miniature pike - sans teeth of course. Just another extreme closeup of a two inch fish! Since I was using pretty fair size bait on a decent size hook, I was hoping for a catfish or two, or if I really hit the lottery, maybe even a bowfin or a gar. So I got really excited when my bobber went down and I came tight on a fish! I was a little surprised though that it was just a little guy. I quickly brought it in and held up what looked like a white bass (not a new species) to my untrained eye, but I took pictures just in case. Later that day I went back and looked at the pictures and realized that it was a bass all right, but I had the color all wrong! It wasn't a white bass, but a yellow - definitely a new species! Not the caliber of fish I was expecting on my big circle hook, but I'm not complaining! Yellow bass species #97! I couldn't get any more bites on the big bait, so I put on a small hook and a little dime-size piece of minnow to try for some smaller species. It wasn't long until I caught several channel catfish. I examined them very closely to make sure they weren't little blue cats - but they weren't. I have the curse and blessing of catching things I don't intend to catch when I'm trying to catch something else and catching things I intend to catch when I'm not fishing for them. If you understood that last sentence, you're way ahead of me... Anyway just before it was time for me to leave I was entertaining myself by trying to get some mystery species of fish swimming near the shore to bite, but unfortunately they were entertaining themselves by fastidiously ignoring every bait I had! After finally deciding it was a lost cause, I looked up at my other rod and tried to find my bobber. But there was no bobber! It was gone, and all the slack in my line was quickly leaving! I ran over and set the hook into what felt like a really solid fish - especially on such a tiny bait! The fish made a couple little runs and some powerful head-shakes, then started coming my way. My bobber finally surfaced about 30 feet from me so I knew the fish was close to the surface. I was excited to see what I had tied in to! However, I was not expecting what happened next. 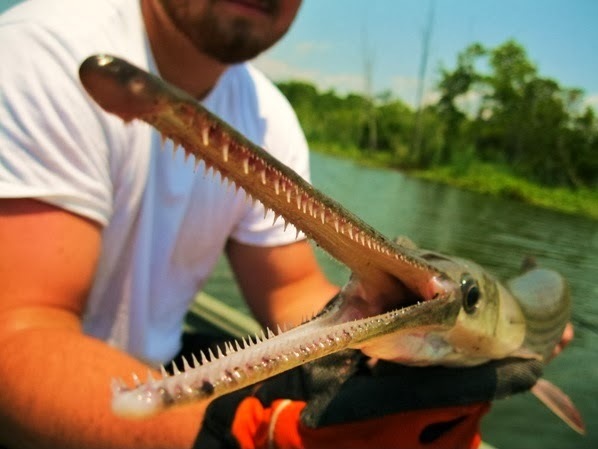 I thought it was maybe a big catfish or something, but instead, a big long beak full of teeth came out of the water followed by the body of a 4 foot jumping longnose gar! This was my dream fish for Arkansas! If I could have chosen one species to catch, this would be it! Unfortunately though, that's where the story ends because as he jumped, my hook came flying out of his mouth. I was left on the shore crying and needing to change my shorts. Now that I think about it though, I was lucky to even have hooked him at all on such a tiny hook (definitely not typical gar tackle), let alone to have been able to fight him and see him jump right in front of me! One of these days maybe I'll learn to catch what I'm fishing for, and fish for what I catch; maybe not though, sometimes the surprises make it more fun!